Local Riders,Local Races: 4th Cat Dreaming with Lewis Stripp! Lewis Stripp is relishing the prospect of working as part of a team as he approaches his fourth season of cycle racing. 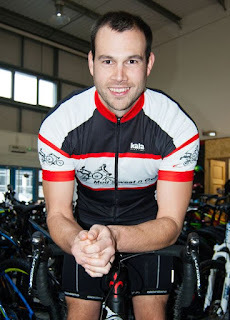 The 29-year-old, from Wyke Regis in Dorset, has previously sported the Mud, Sweat & Gears (MSnG) jersey as a club member. But this season he will be part of the company’s new race team.The squad will have the mechanical support of MSnG, which has shops in Weymouth and Dorchester. But Stripp, who has been something of a lone ranger on the racing circuit to date, is keen to embrace the team ethic. He said: ‘It is quite an exciting prospect to think you will have a team around you to work with and hopefully it will allow us to further our own ambitions more than we could do individually.